Job search can be extremely daunting. On one side you feel encouraged on having received an interview call relevant to your education and skills. And on the other side, when things don’t turn out the way you expected them to be – it feels highly dispiriting. It is natural that a few unpleasant experiences may get you very desperate to land a befitting job. And it is now that you become prone to job scams. Well this is not only true for fresh job seekers alone. Professionals who have been working for quite some time may land in circumstances where they need to look for switching options. However, be it your first job hunting or a transition from one to another, you need to be vigilant and composed while accepting job offers. A wrong job selection can give you a real tough time. Jobs that don’t exist in real, offer thousands of “perks” such as handsome salaries, huge bonus, less working hours and so on and so forth. These may appear to be very irresistible and attractive. Now such “out of the way” goodies act like baits to trap you. It is human nature that when desirable things appear to be very easily fetched, you some how turn blind eyes to possible loopholes. And when it comes at jobs with lucrative salaries, doubting these opportunities is simply impossible. However, keeping yourself in line with job market trends helps you to learn about salary structures, increment policies, working hours etc. that relate to your job profile. Now anything that seems to be far too good than usual market trends is bound to rise suspicion. You then take efforts to know the exact truth related and thus get saved from falling into these pit falls. Well, not all jobs; but seven out of ten jobs do fall in this category. It is obvious that job seekers need to reach their potential employers and not the vice versa. Yes, if you are someone with huge experience and unmatched skills, you may receive genuine job offers quite easily without making huge efforts. Such profiles require wide experience and networking. However, before you land such heights of professional success, it is always needed that job seekers reach their employers and request for interview opportunities. Now, if one fine day out of nowhere you just get a call or an email from a recruiter who is ready to offer you an interview chance, or for that matter an offer letter; you need to analyze it aptly before you get all happy about it . And when you know that you really have not made any effort to get a call such as this, you can be sure that there is something fishy and therefore not worth pursuing. Taking money from applicants is something that features fake job scandals. Unfortunately, many fresh grads fail to identify these twists and end up wasting time, energy and huge money. Cheats who tailor these false jobs charge applicants with huge money, on grounds of on job training, recruitment process expense etc. They even make it refundable after a short duration that makes it more trustworthy. Now, job seekers need to know that no recruitment involves money. Even when the company is a new venture or start up company, they cannot charge money from applicants. Therefore, the next time you find some opening that otherwise looks genuine, but has this involvement of money; reject it outrightly and look for other relevant jobs. 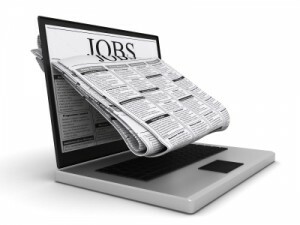 Now, job seekers need to know the prerequisites of jobs they wish to land. Every organization may have different candidate requirements; however, the preliminary skill requirements remain the same. As mentioned earlier, market trends remain the same upto an extent. Employers hiring for the same position need to offer similar salary packages, working hours etc. And, evidently, every company will have similar or enhanced candidate requirements; however, in no way they can look for less efficient employees. Therefore, knowing job descriptions required for profiles is essential to know if the job exists in real or not. 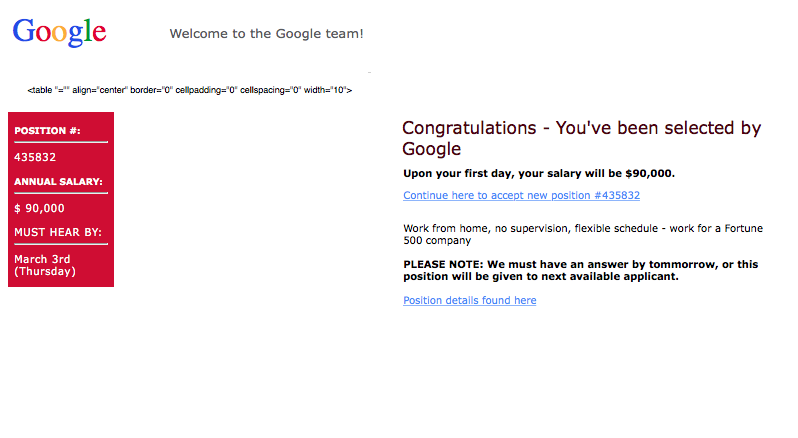 We sometimes get overwhelmed when job descriptions on portals appear to be quite lesser than what it actually requires. Not all of these descriptions can be considered fake; however, most of these do have some loopholes. This is something very easily detectable and therefore does not cause much harm to job seekers. Perhaps, people who are new in this sinful business are not very efficient to post false job openings in a convincing manner. And therefore, people who are habitually dealing with job portals can easily locate these areas of inadequacy. Any form of wrong email standards such as posting jobs from personal emails, no company location or contact details given, unusual email ids and so on and so forth are signs of attempting false job scams. 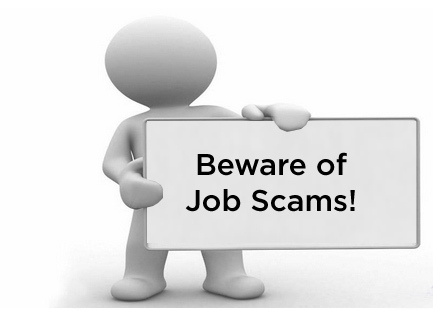 Therefore, stay alert while going through job listings and don’t allow yourself to fall prey to such job scams. Professional recruiters can never have such flaws while posting job vacancies. 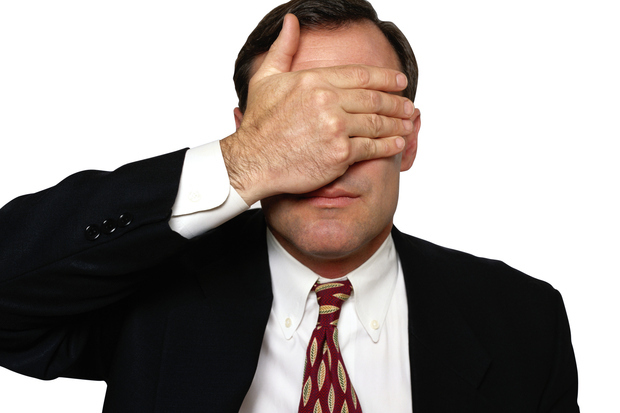 Therefore, any wrong email standards you see in job advertisements cannot have a lucrative job opportunity for you. So, it’s better to just ignore such postings and focus on other promising job offers. On a concluding note, job seekers need to think several times before accepting job offers or even deciding to appear for interviews. It’s always better to rely on your network, career advisors and reputed job portals when you are looking for first jobs or change in jobs.